Somehow, the weeks have flown by in a flurry of family, weekends away, a birthday, and hot hours in the kitchen. We were down in PA visiting family (and riding the coasters at Hershey Park! ), up in the Adirondacks, out for sushi, and spending some time here at home. I really treasure the time with family which made the many hours in the car well worth it–and I got to catch up on some magazine reading. The hot weather has made my garden grow like the plants in the Amazon. I finally had to re-stake the tomatoes today. And the cucumbers have already wound their way among the sprawling plants, making double-headed monsters of the two, spewing tomatoes and cukes in all directions. 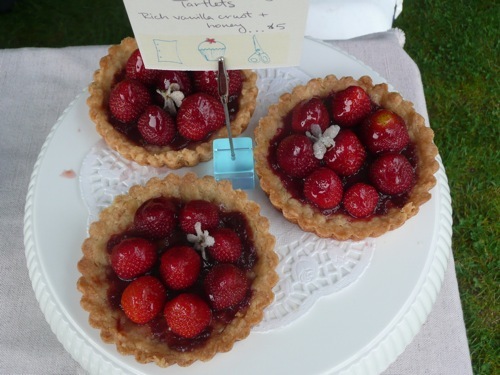 Unfortunately, I have missed 2 farmers' markets, with the strawberry tarts to the left already out-of-season since raspberries and even blueberries vie to be my upcoming pastry stars. Black currants have been picked and jammed, and the onslaught of cucumbers have had thoughts of pickles again dancing in my head. I'd like to give everyone one more shot to jam swap–there have to be more takers out there! If you've never canned before, here's your chance (but please do follow some reliable directions–we don't want to be your guinea pigs, especially when the threat of botulism enters the picture).